Gently mix beef, water chestnuts, 2 tsp cornstarch, 5-spice, and salt in a medium bowl. Shape mixture into 12 balls. In another bowl, whisk broth and remaining cornstarch until smooth. Add meatballs and cook until brown, about 3 minutes. Transfer to a plate. Add remaining oil to pan with garlic and crushed red pepper flakes. Stir for about 30 seconds. Add broth mixture, Szechuan sauce, cabbage, and mushrooms. Cook and stir until cabbage is wilted. Reduce heat to simmer, return meatballs to the pan, cover and cook. About 8 – 10 minutes. 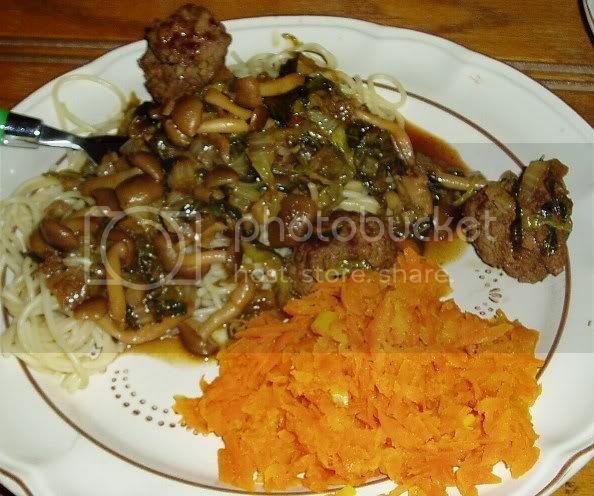 The food next to the meatballs are the ginger carrots, which you can find in an eariler post. I think the recipe was great and simple, but was really made it for me was the Hunan sauce. There was a perfect mixture, of heat and crunch. It was also wallet-friendly and very filling. With the addition of the romain hearts “salad” I don’t feel this needs any side dish either.